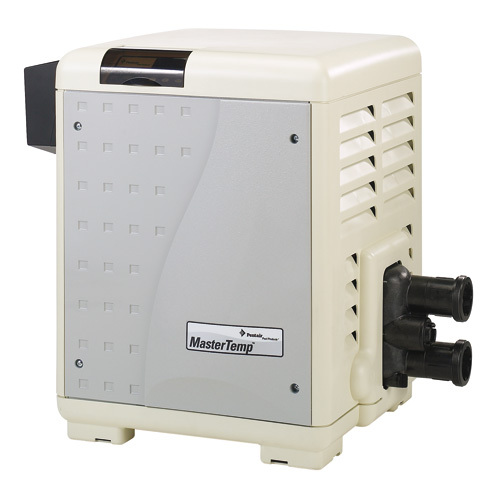 No matter what you require from a top performance heater, The MasterTemp Heaters will meet all criteria. MasterTemp Heaters offer ultra-high performance in a compact, quiet and eco-friendly design. MasterTemp’s easy-to-read controls make system operation and monitoring simple. Pool and spa temperatures can be pre-set and controlled with the push of a button. A digital display indicates the water temperature and LED lights give you system status and let your know if the heater needs service. Whilst MasterTemp Heaters offer the best-in-class energy efficiency, you don’t need to sacrifice comfort with fast heating times so there are no long waits before enjoying your pool or spa. And the compact design (all models 21”L x 21”W x 28”H) and super-quiet operation wont intrude on your poolside leisure time. As part of Pentairs “Eco Select” range you can be sure that it is one of the most “greenest” equipment choices on the market.